I'm so excited for this fun release! I created a fun, calorie free cupcake for your enjoyment! Instructions: Diecut an A2 (4 1/4 x 5 1/2") top fold Metallic Pearl card using the outside Sugarspun Cupcake Die to create card base, making sure that the top edge of the die is slightly off the edge of the card. 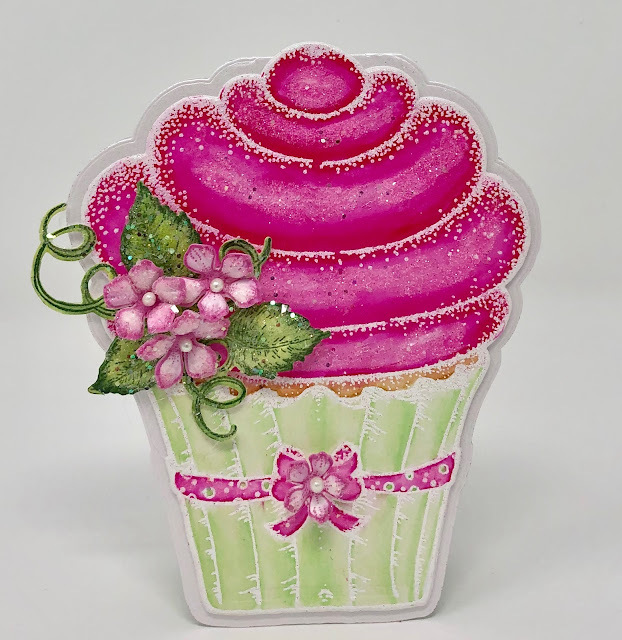 Stamp the Sugarspun Cupcake on watercolor paper using VersaMark, sprinkle with WOW Sparkling Snow Embossing Glitter and heat set using the Heat It tool. Color using Zig Clean Color Real Brush Markers - Pink, Pale Green and Mustard and diecut using inside cupcake die. Diecut two more times from white cardstock and adhere together to create a stronger cupcake. Adhere to the card base. 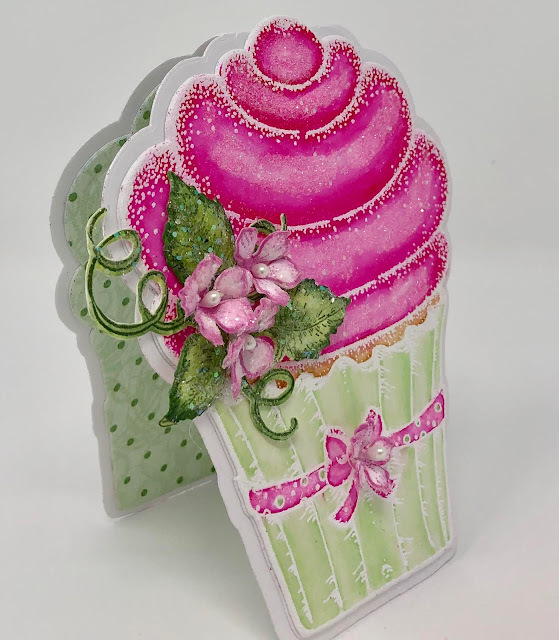 Diecut green paper from the Sugarspun collection and adhere to the inside of the card using dries clear adhesive. Stamp the Petite Florals on Deluxe Flower Shaping paper using Magenta Hue ink. Color using the same ink, diecut using the coordinating die, place in the Petite Floral Mold, sprinkle with water and run through the die cutting machine. Press down in the middle of each flower using the stylus from the Deluxe flower shaping Kit. Pierce the centers using the piercing tool and insert stamen. Sponge with dries clear adhesive and sprinkle with Rajni Chawla’s crystal clear glitter. Stamp the Classic Rose Leaves on Deluxe Flower Shaping paper using Archival Olive ink. Color using the same ink and Leaf Green, diecut using the coordinating die, place in the Rose Mold, sprinkle with water and run through the die cutting machine. Sponge with dries clear adhesive and sprinkle with Rajni Chawla’s crystal clear glitter. projects created by the oh so talented Design Team. Till we meet again, have a beautiful day! 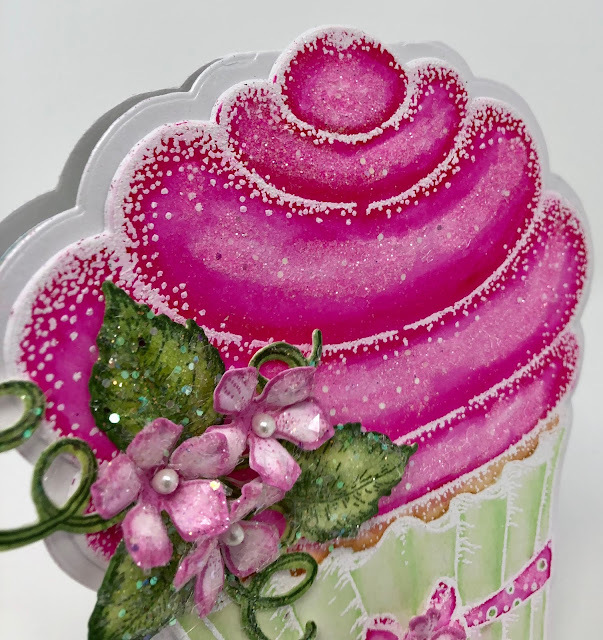 A gorgeous cupcake shaped card. I love the colouring on this and the addition of the flowers! Thank you so much for your kind words. I do love these fun shaped cards.